Data playground - Google Takeout - missing photos? Download them on your own. Recently I decided to use Google´s Photos app to manage all my photos. My collection is about ~7000 photos so it took me some time to create the albums and organize it. 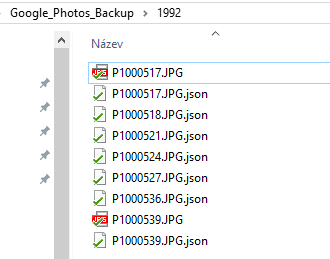 My intention was to do a back up from time to time using Google Takeout to keep the photos backed-up outside cloud as well. Google Takeout is a service for everyone with Google account allowing the users to download back any previously updated data. It means you can download back all your uploaded photos too - so I tried. I thought the Google is reliable in matter of storing/searching/downloading data, well it is Google, right? Who else should? How many photos are missing = were not “Taken out”? ..there is missing quite a lot of files as each JSON file should have corresponding media file - that´s disappointing. It means ~70% is missing! Really Google, 30% “taken out” only? Well, that´s not what I consider sufficient. I know the Google Photos is free, but this is not what I would expect from leading IT company. Besides, I´m not the only one with this issue based on Google´s forum, yet no feedack or reaction from Google. Anyway, let´s to do it on our own. As mentioned, we can leverage the JSON files as they contain the url (to Google server) to each photo. My target is to save the files into the same folder (album) as where is the JSON file. Let´s make a tibble of all JSON files (Photos) we want to extract url from. That´s much better, isn´t it?